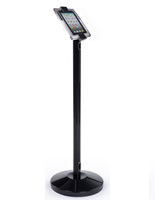 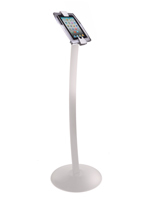 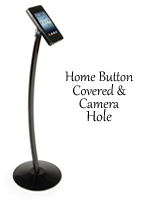 This floor standing iPad mini kiosk features a stylish black curved aluminum post and a clear acrylic enclosure with black accents. 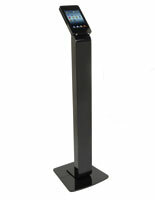 The adjustable bracket rotates to 360° with 90° tilting options for versatile viewing in horizontal and vertical orientation. 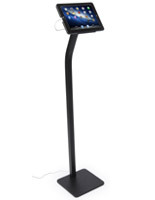 This iPad mini kiosk that is 40.5" tall has an adjustable cover that reveals the "Home" button or keeps it covered, depending on user preference -- some retailers like to control programming. This tablet display station allows the user to charge ports while the unit is running so your'e never out of battery "juice"! 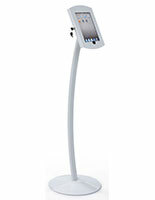 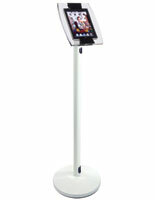 This iPad mini kiosk has sleek styling and is among one of our most popular technology accessories! 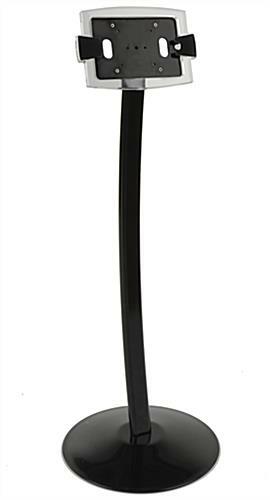 14.0" x 40.5" x 20.0"